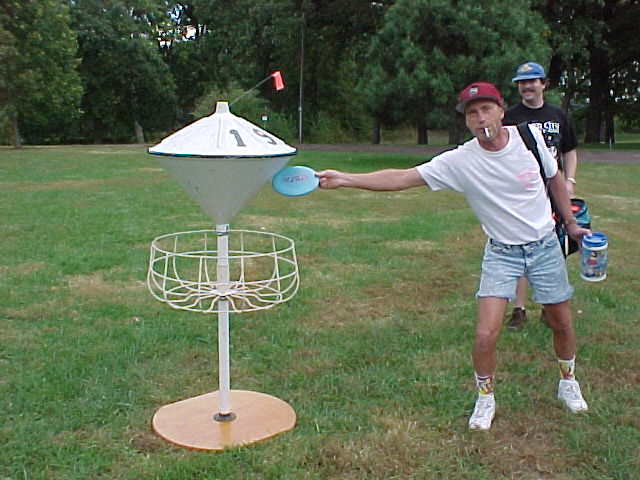 Flying disc enthusiast and instigator of the Elmwood Park course in Omaha, Joe Botsford was instrumental in planting the first seeds of disc golf baskets in Nebraska. He continued by being involved as a player and an active club member. 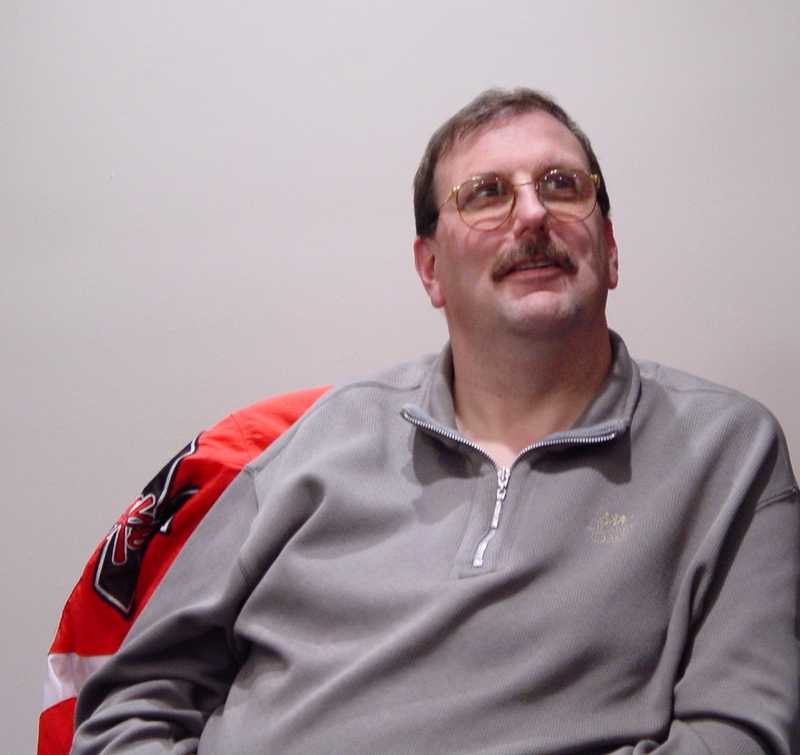 Joe says during college he was involved with sports recreation at the University of Nebraska – Omaha. They received Frisbees and fishing net like poles in a set designed for skills competition and he was asked to organize an event. Perhaps the first organized disc golf related competition in Nebraska! With J.C. Penny as a sponsor, Joe installs an 18 hole course at Elmwood Park in Omaha in the late 1970s. 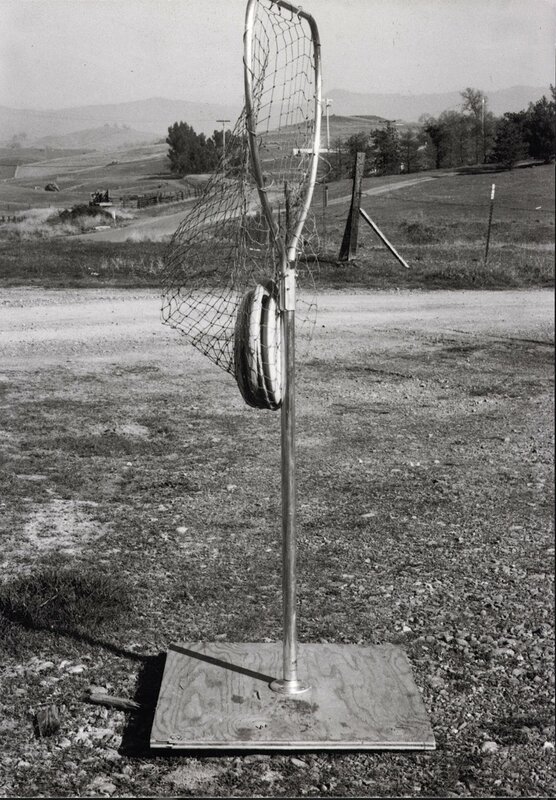 The fiberglass deflection device crumbled in the harsh Nebraska winters and the baskets were pulled after a couple of years. Mr. Bill managed to acquire one still in tact. Mr. Bill demonstrates the Elmwood Park conehead basket. Picture taken at the first fundraiser for Chautauqua Park in Beatrice, 1998. Also pictured is John Kemling. Members of the Lincoln Flying Disc Club receive a plaque for the KFOR / Gooch Foods’ Community Service Award in 1991. Pictured left to right are: Harold Nelson, Deb Beckler, Joe Botsford, Pat Raybould, Bob Ryan (Gooch Foods), Orv Koch (KFOR Radio), and Vince Collura (KFOR Radio). Joe at an LFDC planning meeting, January 2002, ATOS Computer office in downtown Lincoln.